This was the bathroom when we bought the house. 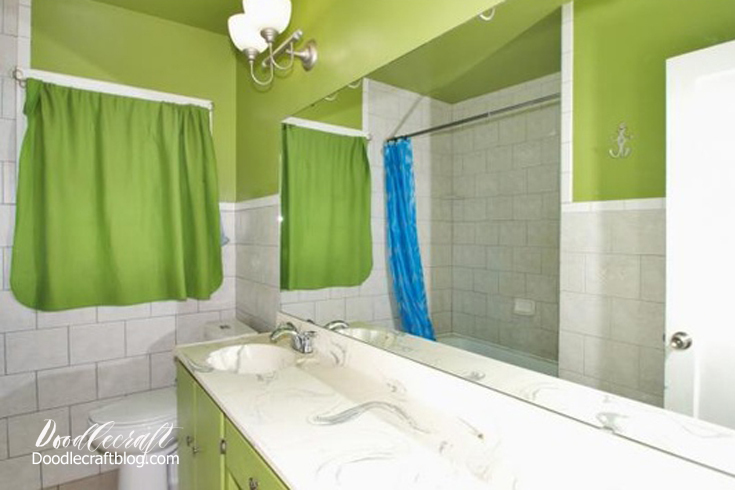 Not a super relaxing room with the bright glow of green! Not great for putting on make-up too! On the second day we had the house, I taped off all the green. Taped around the tile and the mirrors. just the color needed tweaking. I bagged off the lights and taped around the bases. And painted everything light gray, just like the living room! Then let it dry and removed the tape and the bags. And here it sat for months. I didn't even paint the vanity yet. But the ceiling and the walls look terrific! I had my daughter use a brush and paint the vanity. Opening the doors slightly to keep them from sticking. The chalk paint dries super fast. After it dried completely, I put crystal knobs on all the drawers. I needed 11 of them. They glitter and throw dancing rainbows all over the room at about 4 pm each evening. The vanity and walls and ceiling are no longer competing! And then I added just a touch of teal! Now the gorgeous lights, tile and knobs can be the stars of the room! but for now it works just fine! Would you have kept all that green!? I love the grey! It really does make all the details pop.